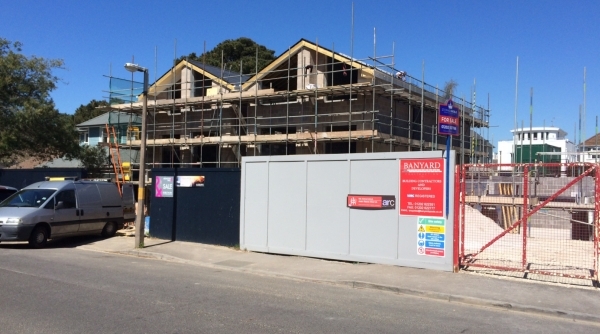 Borough of Poole: Pure Town Planning are delighted to have secured planning consent for a developer client of ours for amendments to previously approved plans reflecting changes which had been made to two new detached dwellings during construction on the prestigious Sandbanks peninsular of Poole. The alterations included raising the approved ridge heights, changes to the external finish of the dwellings, amendments to the approved rear terrace and balcony areas and a small increase in floor heights. Given the history of the site (the fact that the scheme was part retrospective) and the level of local opposition, the application was put before the Planning Committee to be determined. As a result of the well prepared and presented application the appointed planning officer had made a recommendation to the Committee for approval. Following two deputations by a disgruntled neighbour and a Ward Councillor who both spoke against the proposal, Matt presented his four minute deputation to the planning committee in support of the scheme and it was then put to the vote… Matt’s deputation and the presentation by the planning officer in defending the recommendation had successfully convinced the majority of the members that planning permission should indeed be granted and the application was subsequently approved 6 votes to 1 by the Members. If you need to make changes to an approved scheme during construction for one reason or another or you have an application going to committee and feel you would benefit from someone experienced addressing the Members for you then give Pure Town Planning a call on 01202 585524 and let us push home the approval home for you.